1. Preheat oven to 350 degrees. Mix crust ingredients together and pat into round pizza pan. Bake for 10 to 12 minutes or until lightly browned. Cool. 2. Cream all cream cheese layer ingredients together and spread onto cooled crust. 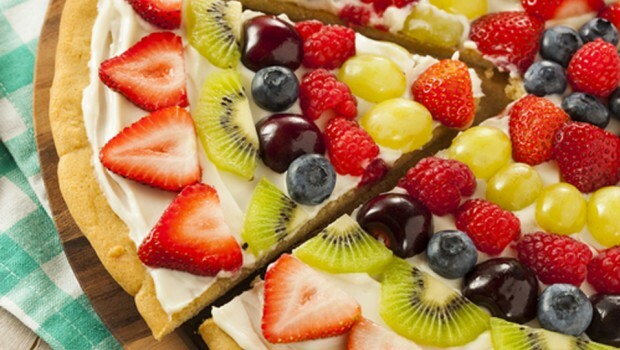 Arrange your choice of fresh fruit in ‘pizza-slice’ sections on top. 3. Mix glaze ingredients together and cook until thick. Pour over fruit while glaze is warm.